Serifos is located in the western Cyclades, has an area of 75.207 km2 and 1.414 inhabitants in 2001. This is the birthplace of Perseus who beheaded the legendary Medusa. Serifos is mentioned in the Odyssey as it is the home of the Cyclops and near the beach of Ganema one can still see remains of Cyclopean walls. The island "participated" in Alexander the Great's expedition in Asia as all swords were forged with iron that was mined from the area of Avessalos. Capital of the island is Chora, which clings above the port of Livadi and is built below the remains of a 15th century Venetian castle. Serifos is a paradise for those who enjoy walking for it is a rocky island and many places are accessible only by foot. Worth visiting are Galani with its 10th century church, Kedarchos with the 17th century monastery and the beaches of Sykamia and Megalo Livadi. Most accommodation and night life is in Livadi. Interesting information about Serifos can be found through the Greek Travel Pages (GTP), the munucipality of Serifos site and Wikipedia. There are busses and taxis (Tel. 22810 51435 - 51245) connecting the port with the Capital Chora and most major settlements. Winter ferry season 1st of November until 31st of March. 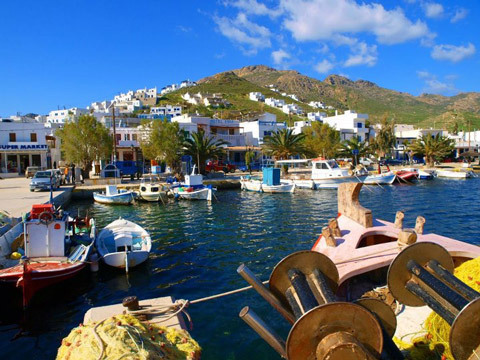 Ferry connections and schedules for domestic routes, like Serifos, are usually announced by most shipping companies, a couple of weeks before the beginning of each season. There are some exceptions though, like Blue Star ferries, which announces schedules in the beginning of the year. Morning: Daily 2 Hydrofoils and 1 conventional ferries 4 times a week. Afternoon: 1 Hydrofoil 5 times a week and three times a week 1 conventional ferry. Information concerning Athens ports serving routes to Serifos can be found further down.